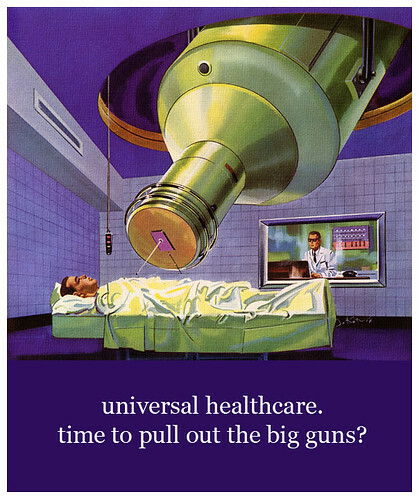 …But I can’t actually understand why so many Americans are so opposed to Universal Healthcare. Can someone please explain to me why implementing a universal healthcare program takes away the freedom of Americans? But with their current healthcare program, there are many (many many) people who can’t choose what kind of healthcare program they want already. Because they can’t afford it. So are republicans saying that those people don’t really matter? Do they realize that there are poor people in their country? Or do they choose to believe that if you live in America, there is no reason that you should be poor? This is very upsetting to me. I’ve heard some Americans argue that those who say they can’t afford healthcare probably don’t have their priorities straight. Let me illustrate something for you though. Recently I had to take Dave to Emergency. The situation looked pretty serious to us. In the end, thankfully, it was not and all was well. It got me thinking though–what if Dave & I were Americans? Now, I like to think that Dave and I have our priorities sorted pretty well for a young couple with a very small budget. No cable, no TV. We make most of our food from scratch (bread, pasta sauces, soups, etc…it’s much cheaper that way). If we need something, we always look in the thrift store first. But I know that we would not be able to afford a healthcare program if we were in America. We value health as a priority, but a having a roof over our head and food in our stomach are the only priorities we can fill. I also think it would be safe to say that Dave & I are hard workers. We both have jobs. We both have small businesses that we run in the evenings and on the weekends. So can you see why I get so very offended when I hear that “If you can’t afford healthcare you probably don’t have your priorities straight.”? I’m not even American and I find this upsetting. …This wasn’t supposed to be a very long blog. In the end, all I can really say is despite the hiccups that occur in universal healthcare in Canada, I see no other way of doing healthcare. To quote Viggo Mortensen, “I won’t consider this country civilized until there is universal health care.” Well said, buddy. Too bad nobody actually cares about the intelligent things celebrities say. This entry was posted on Wednesday, November 11th, 2009 at 3:18 pmand is filed under Politics. You can follow any responses to this entry through the RSS 2.0 feed. You can leave a response, or trackback from your own site.